As we approach the end of the year, we’re preparing to go into hibernation ready for the start of the building works on Winterbourne Barn, its two ranges – the South and West Barn, and the outbuildings. We’re very pleased to announce the news of a grant from LEADER of £42,837, as part of the project to transform the Victorian cow byres and bring them back into use for local micro-businesses. The units will be let to small ventures including artisan trades, and this rental income will help secure the future of the whole Medieval Barn complex. LEADER is a fund jointly provided by the European Agricultural Fund for Rural Development (EAFRD) and the Department of Environment Food and Rural Affairs (DEFRA). We’ve been reflecting on a busy autumn here at the Barn. 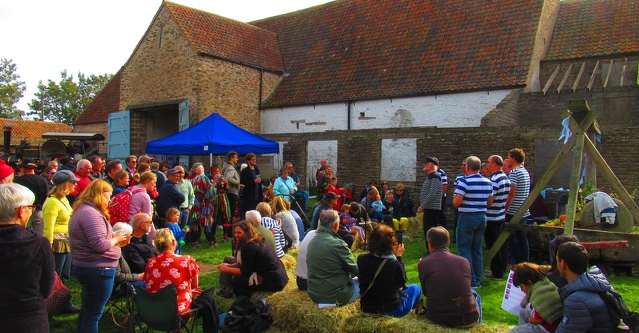 The ever popular Orchard Harvest Day saw 1200 visitors, enjoying the ferret racing, morris dancing, shanty singing, and all the other attractions, food, and drink. Thanks to all who worked so hard to make the day a great success once again. The Cartshed has seen a range of activities including a lecture from Jon Cannon on Cathedrals as Time Machines, a felting workshop with Felt by Fi, an evening Owl Prowl from the Hawk and Owl Trust, and local school St Michael’s joined us for two workshops on medieval life. There’s still time to visit the barn before the end of the year with a host of festive activities seeing us through to December. See the Events page for more information. We might be hibernating in the main barn but we certainly won’t be taking a holiday. We’ll be making full use of the recently renovated Cartshed to keep a programme of workshops, lectures, and nature walks alive throughout 2019. Keep an eye on the event page or our social media pages for up to date information. We’ll also be using this time to develop our education offer, and expand our volunteer team. We are still fundraising to support this ambitious project, head over to the Fundraising page to see how you could help. Barndoor Spring 2018 Can You Help Us Raise The Roof?